It seems like every few months there's a new cellphone, laptop or tablet that is so exciting people line up around the block to get their hands on it. While the perpetual introduction of new, slightly more advanced electronics has made businesses like Apple hugely successful, the short shelf life of these electronics is bad for the environment. Instead of adding more trash to these ever-growing piles, there is an opportunity to create electronics that are biodegradable. That's why other researchers and I are looking to the emerging field of paper-based electronics – known as "papertronics." They're flexible – even foldable – sustainable, friendly to the environment and low-cost. But to be truly eco-friendly, papertronics can't use traditional batteries, which are made of metals and caustic acids, to store and discharge electricity. 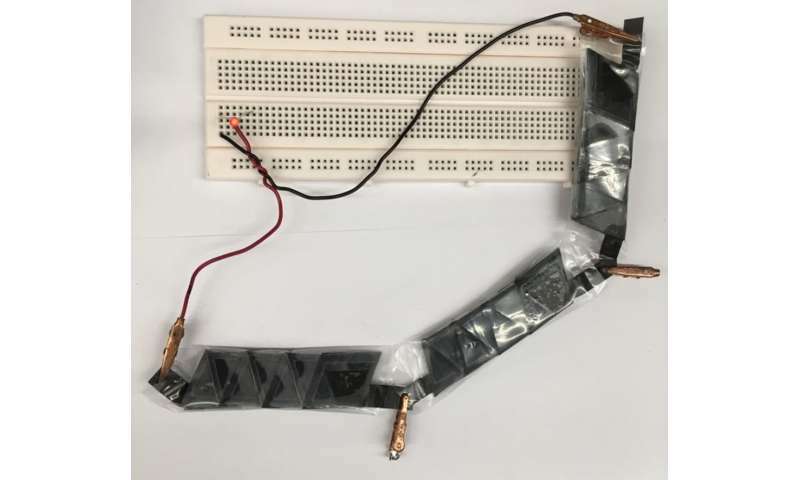 Recently, my chemist colleague Omowunmi Sadik and I developed a paper battery that's recyclable and biodegradable, as well as reliable enough to actually use. The key is bacteria. I've developed flexible batteries, batteries powered by saliva and more. I figured that when seeking to power paper-based electronics, it made sense to try to make a battery out of paper. Fortunately, paper is a good potential battery material: It's flexible, a good insulator – which makes it a good platform for mounting electronic components on – and absorbs and releases fluids easily. We added polymers – poly (amic) acid and poly(pyromellitic dianhydride-p-phenylenediamine) – to improve those electrical characteristics. Then, to store energy in the battery, in place of the metals and acids that react chemically to generate electrons, we added bacteria. 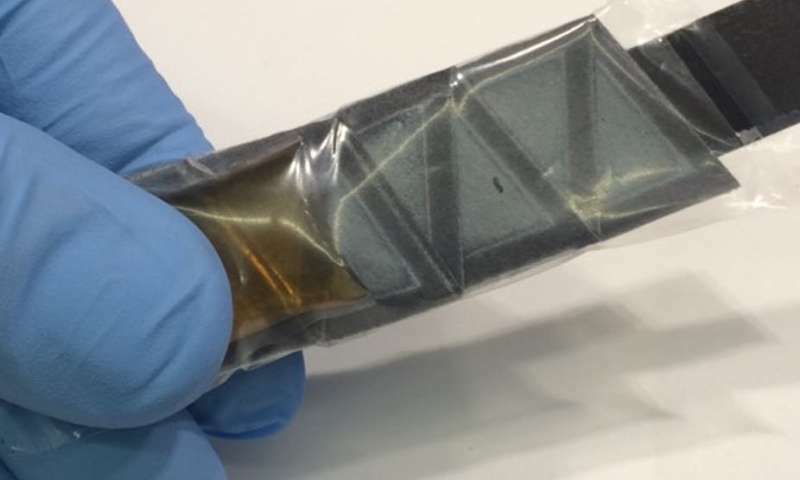 When these batteries are eventually commercialized, they'll use bacteria that are safe for humans and the environment and well-contained to reduce any other contamination. Because the paper is rough and porous, the bacteria stick to it, and generate their own energy by breaking down almost any available organic material, including plant material or wastewater. At the moment, we're prepackaging source material, but it could also come from the environment. This chemical reaction produces electrons. Normally in a bacterial reaction, those electrons would bond with oxygen, but we've built our battery to limit oxygen and substitute an electrode, meaning we can capture the electron flow and use it to power devices. We were concerned that oxygen could get into the paper and interrupt the electron flow between the bacteria, decreasing the battery's efficiency. We found that while that does happen, it has minimal effects. That's because so many bacterial cells are so tightly attached to the paper fibers; they form a multi-layer biofilm that shields the chemical reaction from most oxygen. We also wanted a battery that could biodegrade. The bacteria in the battery itself, once they're done releasing energy, can break down the paper and polymers into harmless components. In water, our battery easily biodegraded, without any special equipment or other microorganisms to aid in the breakdown. Papertronics can be particularly useful in remote areas with limited resources because they're powered by bacteria that can inhabit even the most extreme of conditions and break down nearly any material to produce electrons. They don't need a well-established power grid, either. In addition, though paper batteries are designed to be disposable after they're used, their materials are recyclable – and new batteries can be created from recycled paper. As revolutionary as paper-based bio-batteries are for future electronic devices, they're fairly straightforward to make. The polymers and bacteria can be blended with paper in traditional manufacturing processes, including roll-to-roll printing and screen printing – or even be painted or poured right onto paper.